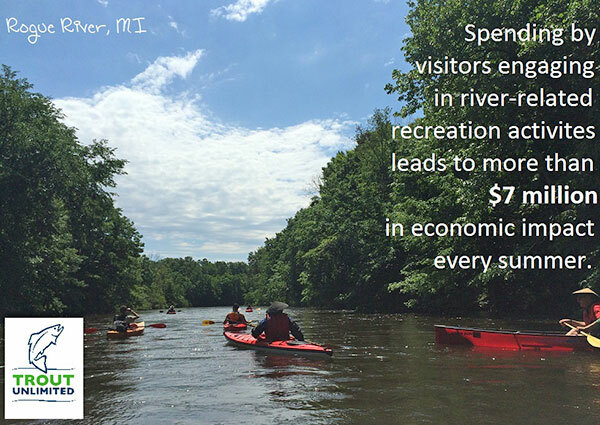 Spending by visitors engaging in river-related recreation activities leads to more than $7 million in economic activity during the four-month summer season. A recent study showing the value of the Rogue River to the area economy bodes well for what can happen in Cedar Springs in the near future. 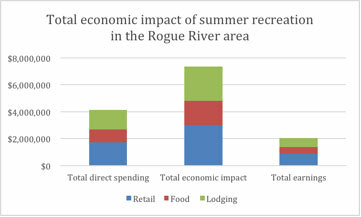 Vaughan said that the economic impact of river-related recreation was assessed using on-site surveys at several locations in the Rogue River watershed in the summer of 2015. Survey locations included: The Rogue Golf Club, Rockford Dam and canoe launch, Grand-Rogue River Access Site and Campground, White Pine Trail trailheads in Comstock Park, Belmont, Rockford, and Cedar Springs, as well as events such as Praise in the Park, Art in the Park, and the Rockford Farmers Market. The analysis of the surveys focused on visitors who 1) were primarily visiting the area because of the Rogue River; and 2) live outside of the watershed. Twenty-five percent of survey respondents indicated that they live outside the watershed and the primary reason for visiting the Rogue River watershed was to participate in river-related recreation activities. Most of these visitors were from the greater Grand Rapids area, including Kent, Ottawa, Muskegon, Newaygo, Allegan, and Ionia counties. About 20 percent of the respondents reported living in Rockford. Other visitors reported residences in Lansing and Ann Arbor Michigan and as far away as Iowa. “Our results found that the total direct spending for the four-month summer season, including both day users and overnight visitors, was more than $4.1 million. The total economic activity, which includes indirect spending, was more than $7.3 million. This led to additional earnings of more than $1.7 million and supported the employment of 64 full time jobs, which is substantial in a small city like Rockford,” noted Vaughan. And it’s not just Rockford that benefits, or will benefit in the future. Cedar Springs is part of the Rogue River watershed, with Cedar Creek being an important tributary to the overall health of the coldwater fishery in the Rogue River. The Community Building Development Team, in partnership with the Cedar Springs Library and the City of Cedar Springs, has several projects planned for the areas bordering Cedar Creek, including a new library, community center, ampitheather, and boardwalk along the creek. Vaughan noted that this study shows that the Rogue River and its scenic and recreational amenities attract visitors from across West Michigan and beyond. “It’s important for the quality of life of local residents and is a significant amenity that drives economic development in the region. Trout Unlimited hopes that these results will enable communities and businesses to better understand the contribution of the Rogue River to local economies and make its protection and restoration a highest priority in decision-making so that these high-quality recreation activities can continue to take place,” said Vaughan.